In the 60s Doak moved north, to explore the Poor Knights Islands (off the coast from Whangarei) with Tarlton, mapping and learning about their unusual ecosystem which combines warm and cold currents. Tarlton developed his own underwater 16mm movie camera housing, using a DC-3 propeller dome. In the early 70s Doak and his wife Jan and family joined American marine biologist Walt Strack on a Pacific undersea research adventure, based on the research vessel El Torito. They used Strack’s yellow submarine and scuba to learn about coral reef ecology, and dived World War II wrecks. They also helped Strack produce The Islands of Friendly Fishes, capturing the previously unseen undersea world of the Poor Knights on film. It would be the beginning of a lifetime using storytelling — film, books, and later blogs — to convey to viewers the wonders of Aotearoa’s undersea world. Documentary The First Move, a Tale of Dreams and Dolphins (1978) followed Doak and his whānau as they studied the sea mammal, a subject on which Doak is an authority. Directed by Kiwi Julian Olivier, it explored the sophisticated social world of dolphin pods, as well as the close relationship between local iwi and the creatures. In Opo (1991) Doak reflects on the famous dolphin’s complicated relationship with humans: from shared delight to tragedy. For a 1981 edition of series Contact, Doak and director Doc Williams looked at the Poor Knights’ volcanic origins. In the 1990s Doak directed a trio of documentaries for NHNZ. Expertise in underwater filming contributed to the company's growing global reputation. In Wild South doco Masters of Inner Space (1992), he shone a torch on the design evolution of underwater species. Castle of the Deep (1995) delved into the ecosystems of the Knights’ sea caves, comparing them to streets where “1000s of metres of vertical descent are traversed [by sea animals] as one swims horizontally into a darkening cul de sac like Rikoriko Cave". 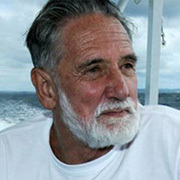 Doak also co-wrote Mirrorworld (1990) with Martin Banks, an award-winning look at Fiordland's water worlds, and was a research consultant for the NHNZ series Deep Blue (1997), which followed currents and winds across the Pacific — from Java Atoll to Doak’s beloved Poor Knights – to chart how they influence ocean life. Doak has been involved in many pioneering dives to wrecks, and was a consultant for the Shipwreck series, which told the stories behind maritime tragedies around New Zealand. He has been interviewed for many current affairs shows, both for his marine ecology knowledge and as an advocate for conservation (including a 1995 60 Minutes profile entitled ‘Wade’s World’). He has guided German, Japanese and French TV crews to the Poor Knights, a topic for which he is an acknowledged expert. His own films include DVD catalogues of Poor Knights’ fish species and invertebrates, and charts of seasonal changes. Doak was instrumental in securing marine reserve status for The Poor Knights; they received full protection in 1998. In 2012 he was awarded a Queen's Service Medal for services to marine conservation.